Look straight ahead, into the mirror of your soul. Take a long, hard look at your recent self. Is she whom you want to continue to be? But first, embrace what you face with grace. Jonathan Saunders understands that we want to be graceful, without gasping for air each time we try to move. If you didn’t like your old patterns, create new ones. Resolve to follow the pursuits that you love most, and wear what suits you the most. Change the colour of your thinking. You are the artist of your reality. Colour outside of the lines you know. But you cannot forge your future without acknowledging your past. Life is as intricate as it is simple. Give it a nod of gratitude for its teachings. Beauty comes from little pieces of thread being woven into fabric, from small lines being transformed into a pattern, from individual steps creating a journey. It may not be a straight line ahead, but the curves are what keeps things interesting, after all. It’s all in your view, really. Change how you see yourself and the world will see you differently, too. Be positive. Be confident. Be beautiful. Believe – and it will be. Wishing you and your 2012 selves a gorgeous year ahead! 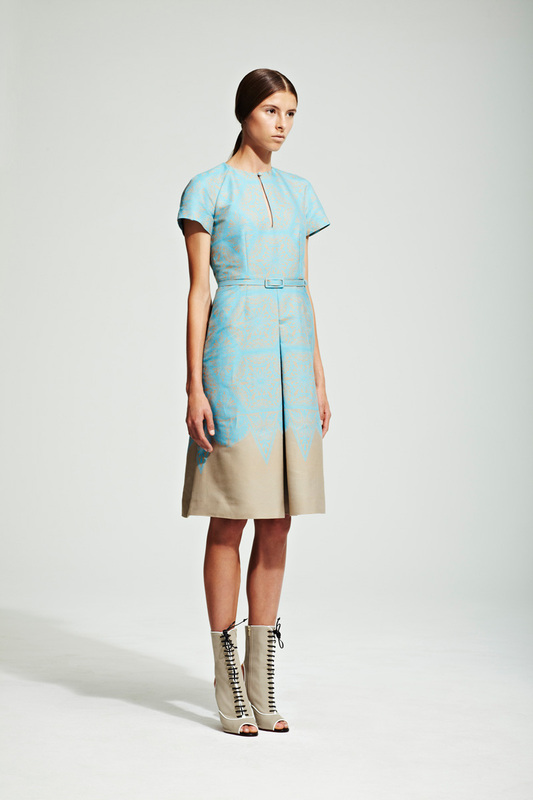 All images from the Resort 2012 collection by Jonathan Saunders via Vogue.com.